Doctor Sloth is up to his old tricks again! His latest batch of Robotic Neopets did not go according to plan. The Robotic Neopets had no weapons, no malice, no anger - they were useless for taking over the world! So he threw them all away... into a place he knew they would never escape from... A TOY BOX! Your job is to get these Robotic Neopets to safety. On each level you must use each Neopet's ability to try and guide all of them into the exit (little brown door) in the fastest time possible. 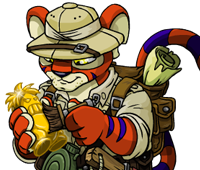 Each Neopet has a special ability; for instance, the Kougra can dig and the Mynci can climb. Lastly, watch out for the spikes, lava, and other dangers that you would usually find in the toy box of an evil scientist :) Good luck! You play a hungry Spyder in search of tasty treats. Are you brave enough to face Fyora's Quest? Hurry, deliver a message for King Altador! How long can you keep a Zurroball in the air? You are about to send feedback on Toy Box Escape. We would appreciate it if you could give the game a rating out of 10, and also tell us any additional comments you may have. Thank you for your feedback on Toy Box Escape.